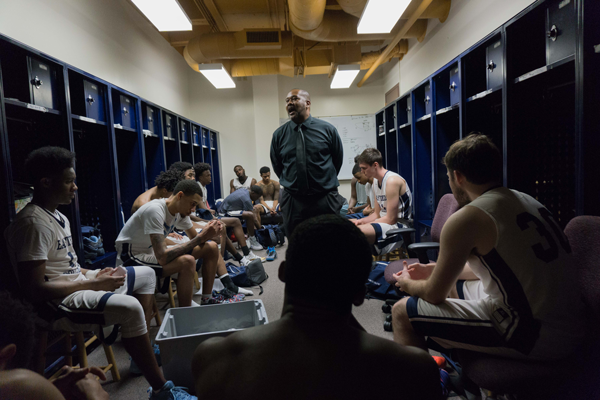 Eastfield coach Anthony Fletcher, center, gives his post-game delivery in the team’s locker room following the Harvesters’ Feb. 7 loss to Brookhaven. Photo by Andrew Gonzales/The Et Cetera. Eastfield basketball coach Anthony Fletcher said Brookhaven would be a dangerous team to play against despite their losing record, that the stakes were high for that game. JR Delley goes for the basket against Brookhaven. Photo by Ahmad Ashor/The Et Cetera. The Eastfield Harvesters’ basketball season ended abruptly with an upset home loss to the Brookhaven Bears, a team that had not won a single conference game, in the first round of the Region V Metro Athletic Conference Tournament. The Bears finished last in the conference standings with a 0-10 in the MAC and 14-17 overall. But they shocked Eastfield (22-8) on Feb. 21 by shooting 53 percent from the field (37-for-70) and matching that percentage from 3-point territory (9-for-17). Fletcher said the loss was tough for the players to take, especially since the Harvesters had advanced to the national tournament in three of the past four seasons, but he said it would help shape their personal growth. Sophomore shooting guard D’Angelo Streeter, who broke the school record for most points in a single game earlier this season with 56 points, said it wasn’t the way the Harvesters wanted to finish the season. Eastfield sophomore point guard JJ Murray, who led all scorers in the game with 28 points, agreed. Ishmael Hook sits in disbelief in the locker room following the Harvesters’ loss to Brookhaven. Photo by Jesus Ayala/The Et Cetera. In the decisive game, the Harvesters lacked the shooting consistency they had throughout the season, hitting only 42 percent (32-for-77) of their field goal attempts as a team. In the first half of that game, the Bears had an explosive start, holding the lead and never giving it up, leaving the Harvesters to play catch-up. Brookhaven kept that momentum going in the second half, making it a 19-point game with just less than 10 minutes remaining. The Harvesters found their rhythm and started playing to their strengths, bringing the game back to within three points with just over two minutes left, but they were ultimately unable to get back in the game. Streeter, Murray, shooting guard Paul Ard and forwards Kent Garrett and Jacob Donahoe all played their last games for Eastfield in the loss. They look forward to continuing their careers elsewhere. Although Murray is unsure of what he plans next, he believes everything will work out. Streeter also said he has a big decision ahead of him.